One sentence summary of “Sources of Power” : We all have to make decisions, and sometimes these decisions have important – or even dramatic – consequences, which must be taken into account at difficult times and within strong time constraints; how do firemen, soldiers and doctors take split-second decisions when lives are at stake? This book tells us about it, detailing various theories illustrated with stories and case studies. In 1984, Gary Klein carried out his first case study to try and understand how people make decisions, particularly under heavy time constraints. The task was to study how firefighters make choices in the heat of the moment, as part of a contract struck with the US Army. Amongst the predictions suggested at the start of the study, the author and his team thought that the firefighters would only have little time on the field to think of all the options and that they would only consider two options: that which was intuitively their favorite and another, which would be used for comparison to demonstrate why the favored option was the best. For his hypothesis, Soelberh studied how his students made a natural and determining choice: choosing their first job whilst they were still finishing the course. He discovered that his students did not use the rational choice strategy, but instead followed their instinct and made the choice they felt the most attracted to. After interviewing his students, Soelberg was able to identify their favorite job and predict their final choice with a success rate of 87%, 3 weeks before his students would announce their decisions. When Soelberg asked them if they had reached a decision, they would deny it, claiming that a choice is made by studying several possibilities, just as Soelberg had taught them. However Soelberg noticed that students, in order to feel like they had made a decision, tended to take another offer, compare it with their favorite choice, and then tried to demonstrate how much the latter was preferable. Then they would declare it to be their decision the instinctive choice Soelberg had previously identified. They were therefore not making a decision; they were constructing a justification. Gary Klein and his team hence suggested that the firefighters would do likewise. But strangely, as they were interviewing Fire Officers, it appeared that they never seemed to simultaneously compare two options. Some Fire Officers even insisted on the fact that they never actually made decision, in the sense of studying two or several options at once in order to evaluate the strengths and weaknesses of each. They simply did not have the time. Everything would have burnt before they’d had the time to study all the options, never mind weighing and comparing. Let’s find out the decisional system firefighters actually use. Studying deeper, the researchers realized that Fire Officers did not refuse to compare options: they didn’t have to do it. Fire Officers are experienced firefighters. Even faced with a complex situation, they are able to see what is familiar to them and how to react. Their experience allows them to immediately identify the first thing to do to respond to a situation, therefore they do not bother thinking about other ones. They are not stubborn. They are competent. This is what the researchers call recognition-primed decision-making, or RPD model. So does this mean that firefighters systematically implement the first thing that comes into their heads? No. They evaluate the feasibility and the chances of success of the first option that comes to mind. If these two parameters appear too weak, they then reject this first option and evaluate a second one, and so on, without comparing two possibilities at the same time. This is what the researchers call singular evaluation approach, to differentiate it from the comparative approach. These are not easy to differentiate: when you are ordering a meal, you are probably going to compare all the dishes on offer to find the one you like the best. If you are in an unknown city and you are almost out of gas, you are going to look for gas stations and stop at the first decent one, without comparing all of the city’s gas stations in order to find the best value for money. Singular evaluation approach is therefore a strategy that makes you opt for a satisfactory decision. It is very different from making an optimized decision: in order to be satisfied, you only need to make the first decision you deem suitable, in order to optimize you need to consider a large number of choices and only select the best one. This satisfying decision strategy obviously makes sense in an emergency situation such as those firefighters encounter. In his case, however, how can firefighters rule out or select an option, if they’re not comparing it to another? They use mental simulation: they mentally picture the scene from the option they are considering and can see the consequences happening in their heads. If these consequences appeal to them, they select the option. Otherwise, they mentally simulate the outcome of another decision. As we will see below, mental simulation is not free of failures. But it is often the best available tool usable within the allocated time. Before he began his study, the author thought that novices were jumping more impulsively on the first option they could think of, whereas the experts would carefully study the merits of each option. It in fact appeared that the opposite is true: experts know what to do and therefore immediately think of a viable solution faced with a problem, whereas novices have to compare various approaches, when they sometimes do not have time to do so. Therefore, almost 80% of decisions were taken using singular evaluation approach based on the RPD model. One of the first lessons to draw from this analysis is to be skeptical as to the formal decision methods. These are methods that are rarely used. Intuition depends on the use of experience to recognize key patterns that indicate the dynamics of the situation. Because patterns can be subtle, people are often unable to describe what they have noticed and how they judged a situation as typical or atypical. He absolutely did not suspect that there was a basement underneath the house. He did not suspect that the seat of the fire was located in the basement, underneath the living room where he and his men were standing before they left. But he was wondering why the fire was not reacting as it should have done. The living room was hotter than what he would have expected for a small kitchen fire in a small house. Everything was very quiet. Fires are noisy, and for a fire to be this hot, he would have expected more noise. The whole pattern was not working. His expectations were not happening as he was expecting them to. With hindsight, it was obvious that the living room was hot and silent because the flames were located below, and therefore the floor was muffling the noise of the fire. But in the heat of the moment, nothing was hinting at this. Thus the events were not typical, and his reaction was to withdraw, to regroup and to try to better understand what was going on. The lieutenant’s experience had given a firm set of patterns. He was used to form an opinion of the situation by matching it to one of these patterns. He may not have been able to articulate these patterns to describe their particularities, but he was relying on the match with the pattern to trust in the identification of the situation he was in. Nevertheless, he was not aware of how he was using his experience because he was not using it consciously and deliberately. He could see what he had in front of his eyes, but not what was going on behind them, so he attributed his expertise to an extra-sensory perception. He was both proud to understand that his intuition was directly derived from his experience and disappointed to understand that he had not had an extra-sensory perception. In order to develop our intuition, we therefore need to expand our experience by being exposed to numerous difficult cases. Mental simulation is the ability to imagine people and objects consciously and to transform those people and objects through several transitions to finally picture them in a different way than at the start. It is therefore building a sequence of snapshots allowing you to picture what is going to happen. Indeed, imagine that you have a truck, as it is pictured on the left, and that you would like it to balance on a pile of large bricks as pictured on the right, using only a jack and an unlimited number of bricks, by yourself. In order to try and find a solution, you are going to imagine several mental images of the necessary steps to achieve it, evaluating the feasibility of these and picturing other steps if this one appears to be impossible. You can figure out these steps visually, or logically, but in both cases it is a mental simulation in which you are imagining a series of different steps leading to the desired result. All human beings use this system when they have to imagine a solution to solve a problem. But mental simulations do not always work. Our brain can only partially apprehend reality, and there is therefore a limit to the variables we can take into account in a mental simulation. We sometimes forget or fail to predict one or more parameters and nothing happens the way we had expected. In fact, according to the author and his team, we rarely construct mental simulations involving more than three factors. The limits of our working memory – the temporary memory used for our actions in the present – must be taken into account. And generally, mental simulations do not construct any more than six steps: beyond this, our working memory appears saturated and the implementation of simulations is made more difficult. We must therefore assemble our simulations within these constraints. There are of course several ways of overcoming these constraints. If a particular topic is very familiar, we are able to gather several transitions into one unit and do likewise with the various factors to be taken into account. Moreover, with the right expertise, we are able to pick the right level of abstraction. Another way of overcoming these constraints is to write things down and draw diagrams in order to keep track of the transitions. The problem becomes more complex when moving elements interact with each other at each step, as we must remember more elements and even the diagrams become useless as arrows start overlapping to represent these interactions. Considering all these factors, building mental simulations no longer appears to be easy. We must be very familiar with the task we are simulating and think at the right level of abstraction. If the simulation is too detailed, it can overload our working memory, and if it is too abstract, it doesn’t help much. In fact, if we compare our brain to the powerful supercalculators in which scientists and the military invest millions of dollars, we could say that our brain has a very flexible and advanced simulation capability, and is endowed with imagination – unlike the supercalculators – but only has a very limited working memory. A computer has an enormous memory and is able to follow thousands of variables and interactions at the same time, but it is a very specialized tool and can only simulate environments for which it has specifically been programmed. The greatest danger of mental simulation is that you may imagine all the evidences that are going to corroborate your estimation of the situation. Unfortunately, if you are sufficiently determined, you may never give up the idea that your mental simulation is Right and matches reality. As contradictions to your mental simulations come along, you may still continue to believe in it by imagining more and more complicated and deeper explanations. Thus, Sir Francis Galton, at the end of the 19th century, tried an experiment in order to see if he could understand what the paranoids feel. He tried to maintain the belief according to which all the people he met were plotting against him. Two people were talking and suddenly looked at him? They were part of the plot. A horse swerves when it sees him? Even the animals are against him. Galton carried on as he could but had to give up before the day was up. His paranoid explanations were becoming so convincing that they were starting to become out of control and he was afraid for his own mental balance. One of the reasons for this problem is that once we have constructed a mental simulation, we tend to fall in love with it. Whether we are using it as an explanation or to make predictions, once it is finished, we may lend it more credibility than it is worth, especially if we are not all that experienced in this field. Despite these limitations, simulations allow us to make skilled decisions and to solve problems in conditions in which traditional analytical decision strategies cannot be applied. Researchers have imagined a method to allow people to be more sensitive to the alternative interpretations of a situation. You must ask someone to give you an explanation about something, an explanation in which he will have the most extreme trust. Then tell him/her that you have a crystal ball telling you that this explanation is wrong. The crystal ball has not shown you why. The person must find out by him/herself another explanation, which will help him/her greatly see that one situation may have different explanations. One of the basic aspects of the RPD model is that experienced people can apprehend a situation and judge whether it is familiar or typical, or not. Often this judgment happens so quickly and so automatically that we are not aware of it. Sometimes, however, we must try to lend a meaning to the various clues. Mental simulation is a way of giving meaning to events and to create an explanation. The awareness of a situation can be formed rapidly, through an intuitive cross-checking of the patterns, or deliberately through mental simulation. Sometimes a situation reminds us of a previous event, and we try to use analogy to understand what is going on. By evaluating a situation, people construct a mental simulation of the way in which the events have evolved and the way they are going to keep on evolving. The more experienced the decision makers, the clearer and more precise the expectations. By checking if the expectations are satisfactory, the decision maker may judge the adequacy of mental simulation. The larger the difference and the more efforts needed to explain the conflicting differences, the less the decision maker will trust in his mental simulation and his diagnostic. Someone who has apprehended a situation will be aware of several typical ways of reacting to it. We have seen with the RPD model that a person will be able to choose the first idea coming into their head, without bothering to try other ones, especially when they are in a hurry. But few of us are impulsive enough to always act in this way and most major decisions are not made this way. Mental simulation allows gauging various ways of reacting, by accepting them or rejecting them, one at a time, without the need to compare them. The firefighters make most of their decisions in this manner. Studies show that the great chess players do likewise. But there are certainly times for comparing options rather than evaluating them one by one. For example, researchers have shown that when airline pilots have to deviate from their route and land at a different airport, they simultaneously compare the benefits and faults of each. Although mental simulation plays a role, pilots do not use the RPD model here, because, even with restricted time, there are sometimes moments when you need to compare various options. Time constraint is great. In this case, evaluating each option in comparison with the others and determining the comparison and analyzing criteria take too much time. People are more experienced in this field. With experience, people have more trust in the first actions they consider being the right ones. Conditions are dynamic. The necessary time and effort to implement a detailed analysis can be wasted if the conditions change. When the objectives are not quantifiable. The ambiguity makes it hard to implement evaluation criteria that can be applied to all the options. They must justify their choice. Hierarchic authorities generally look for evidence that alternatives have been envisaged. Conflict resolution is a factor. When all the conflicting parties have different priorities, it is important to find a common comparison, which can put all the expectations in a similar format. The decision maker is trying to optimize in order to find the best course of action. This is fundamentally what comparison is all about. Singular evaluation is attempting to find the first acceptable, but not necessarily the best one. The situation is complex. If it is something that no one can easily recognize or conceive, like analyzing an investment portfolio, to find the best strategy. This section explores the means used by people to use leverage points – a small difference that makes a big difference, a small change that can turn a situation around – in order to create a new chain reaction, and the way they are able identify what could cause problems before there are any signs of trouble. A leverage point is a focus for building a solution. It is the starting point for an insightful problem solving. If you need to move a rock, you can lean your shoulder against it and push with all your might to counteract its enormous inertia, or you can study the rock and its environment to find the flaw which will enable you make it move or tumble. The leverage points play an important role in many fields, and there are examples galore in the business sector. For example, the realization by Boeing engineers that commercial jet liners would have an enormous advantage over propelled airplanes was the creation of a major point of leverage. The engineers had not yet designed such a plane and they didn’t have a market for it. But they had a concept and the curiosity to find out what was going to happen if they fitted jet engines on airline planes. The rival companies such as Douglas with its DC-8 came later and were never able to commercially compete against this plane. Similarly, the very well known example of Henry Ford realizing that he could make motorcars using mass production to reduce costs so that most workers could afford his T-model, is an excellent demonstration of the discovery and use of a leverage point. Before that, Ford was only one of the thirty American car manufacturing companies fighting for a luxury and artisanal market. Similarly, scientists, the military, sportsmen, chess players and many others need to identify and use leverage points. Leverage points are just possibilities – pressure points that can lead to something useful, or nowhere at all. Expertise may be useful in identifying them. Experts know how recordings are compiled, be it cards, manuals, diagnostic tests or taking-off checklists. They know when you need to follow the steps and when you can make an exception. We must also detect the leverage points that can work against us, in order to learn the weaknesses of our plans. They are sometimes called bottlenecks. By detecting them, we give ourselves time to take preventive action before an emergency situation occurs. Note: although Gary Klein doesn’t talk about it explicitly, the leverage points are simply the 20% of action leading to 80% of results. 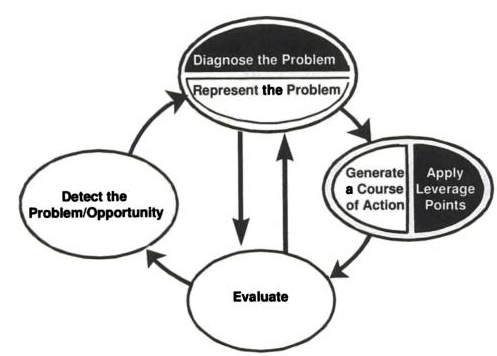 The leverage point concept leads to thinking about problem solving as a constructive process. It is constructive in the sense that solutions can be created from leverage points and that the objective’s profound nature can be clarified whilst the person solving the problem is trying to develop a solution. There is no output stage as each one of these stages can generate a different type of output. Problem detection is in itself an output, for example in military or health and safety radar surveillance stations of a country. Problem representation is another output, sometimes sufficient for determining how to proceed: there are certain medical diagnosticians whose job consists mainly of providing an excellent problem representation. Producing forecasts is in itself a professional specialism in many jobs. Generating an action plan is the step many people consider to be the output of problem solving. But whatever way options are generated, they will have to be evaluated, often through mental simulation. The evaluation process can lead to adopting an option, or to identifying new barriers and opportunities, which require further problem solving. The pattern shows why the process is interactive and non-linear. The objectives affect the way in which we evaluate the action plan, and evaluation can help us determine better objectives. And the objectives determine the way in which we evaluate the situation, and the things we learn about the situation change the nature of the objectives. The objectives determine the barriers and the leverage points we are looking for, and the discovery of these barriers and leverage points alter the objectives themselves. The way we identify the causes leading up to this situation also affect the types of objectives that are adopted. Moreover, the leverage points we become aware of go beyond our own experience and our own abilities – on another interaction level. A parent company has a network of franchises. Each of these franchises uses telemarketing to get customers and each must hire, train and manage telesales staff, which the franchise managers find hard going and annoying. The marketing director of the parent company identifies this as a problem, but with an obvious solution: the parent company can centralize telemarketing onto one site. The head of the business is not too keen on the idea, as it requires a large investment. He then realizes that, with a centralized team of telesales staff, he could develop his idea of taking orders directly over the phone. At this point, he becomes even more enthusiastic about this project than the marketing director himself. Whilst the marketing director and the chairman were doing a mental simulation of the proposed telesales center, the chairman noticed a new possibility. The idea to use telesales staff for sales increased the aspiration level of the chairman and changed the nature of the objective he wanted to pursue. This opportunity also suggested additional series of actions, which can easily be integrated into the original objective to help the franchises. This section is about expertise. Experts can be considered as having accumulated a lot of knowledge. Although this is undoubtedly true, it creates an image of people whose brains are full of facts, burdened by a memory of knowledge and wisdom. However, Gary Klein has a different approach; according to him, the accumulation of experience doesn’t burden the experts: it makes them freer. Experts see the world differently. And often experts do not realize that the rest of us cannot detect what is obvious to them. Structures that novices cannot see. Anomalies – events that have not occurred and other violations of expectations. The Big Picture (awareness of the situation). Events that have already occurred (the past) or those that are about to happen (future). Differences too small for novices to detect. These aspects of expertise can be drawn from two main power sources: pattern matching with reality (intuition) and mental simulation. Intuition allows the expert to detect the typical things and spot the anomalies or the events that have not occurred. Mental simulations allow seeing what has not previously occurred and what is probably going to happen in the future. There are also additional sources of power. The ability to make fine discriminations probably involves some perceptive learning, even though it is hard to distinguish it from the ability to make the pattern match reality. Experts are indeed able to see the differences that novices cannot be forced to see. For example, to a novice, all wines taste more or less the same, whereas a wine expert can distinguish the taste of each wine, and even each year for each wine. Expertise is thus more learning how to perceive rather than knowing. Note: it is important to note that it is possible to believe so strongly in one’s discipline to believe oneself to be an expert when that discipline has no serious grounding. For examples, the ancient forecasters thought themselves to be experts in the art of reading the future in animals’ entrails, or the inquisitors of the Middle-Ages in the art of detecting the demons in witches, whereas instead of perceiving patterns, they were inventing some that had nothing to do with reality because they were missing a very important tool in their intellectual process: the validation of their hypothesis by experience. It is the foundation of the scientific process. And it is lacking, for example, for astrologers, graphologists and many other people, even to geniuses like Steve Pavlina. Be careful when you elaborate patterns to make sure they match reality by testing the hypotheses you rely on. Otherwise, you will be inventing a snake biting its own tail, and the concordances you will perceive will be mere products of your imagination to which you are granting too much credibility. For example, if you are an astrologer, it is easy for you to determine your ability to predict the future: write down your predictions as you go along, and then check that they have happened, and carry out a statistical analysis: how many times were you right? Be careful in this case not to let your ego protect you by carrying out predictions that are sufficiently vague and nebulous to be more or less always valid whatever the issue, or by justifying your mistakes with numerous complex and convoluted reasons. We would be overwhelmed if we had to treat everything we see, each visual element, as a separate element, and had to understand the connections each time we opened our eyes or moved them from one viewpoint to another. Thankfully, this is not necessary. We see the world through structures. According to the Gestalt, or Psychology of the Form, we have powerful organizers that structure the visual world into forms, and we naturally see things have correlations with each other. Indeed, if a group of birds is flying in the distance, we see it as a group sharing a common state. Each time the group changes direction, we do not have to follow the trajectory of each individual bird. If a bird leaves the group and starts to fly on its own, then only will we notice this bird and it will acquire a distinct identity. It has broken the previous structure, which creates a contrast attracting our attention. According to Gary Klein, we organize the cognitive world in a similar fashion – the world of ideas, concepts, objects and relationships. We link them into stories. By understanding how this happens, we can learn to make better use of the power of stories. Stories such as this one contain numerous lessons; they are extremely efficient learning tools and are rich in teachings, which is why they are so abundant in all circles. They show how context can lead individuals to make the wrong decisions, and highlight the causal relations previously unidentified and the unexpected solutions that the characters have found to solve problems. To learn more, I invite you to read my summary of Chapter 6 of Made to Stick – Why Some Ideas Survive and Others Die, called “A Story”, which synthesizes most of the ideas in the chapter. Unsurprisingly, the authors rely on this present book to explain the importance of stories 😉 . People use analogies and metaphors to complete a wide diversity of difficult tasks: making sense of situations, generating predictions, solving problems, anticipating events and making plans. An analogy is an event or an example taken from the same area or a similar area as the task to be undertaken. A metaphor comes from a different area. Each experience we have – whether we have lived it or heard it – can serve as an analogy or a metaphor. Each time we complete a task, we can use this vast base of knowledge, full of experiences, stories and images. For example, when Apple designed the Macintosh and the Lisa using ideas provided by Xerox’s Palo Alto Research Center, such as the mouse and the graphic interface, the designers had the idea to use the desk as a metaphor of what happens on screen. The users were going to use files, folders and documents on their virtual desktop, just like on their real desk. Metaphors affect the way we see and interpret facts. Indeed the metaphor “Debates are like war” tells us that we ought to attack the other’s positions, especially its weaknesses, and defend our own. The metaphor “Debates are like music practice” instead suggests using a debate as an opportunity to find how we contribute to the discord. Metaphors do more than embellishing our thoughts. They structure our thoughts. They condition our sympathies and our emotional responses. And they help us gain an awareness of the situation. They determine the things we consider to be obvious and the results we pursue. Studies have shown that designers use a lot of metaphors to design innovating products, often drawing inspiration from existing products. For example, the designers of the first word processors used the typewriter as a metaphor and the work of the interface designer was to build around this metaphor avoiding dissimilarity. They also had to post warnings to remind users to regularly save the file, which is necessary on a computer and not on a typewriter. Whenever we try to solve a diffuse objective, one strategy is to try and reach that objective by using failure to define this objective more clearly. For example, if in the morning, before going to work my car will not start, my ultimate objective is to get it started, but it is diffuse because the process required to get it started is not defined, as the cause of the breakdown is unknown. I can therefore carry out various trials and errors until I find the cause of the breakdown and my objective becomes more precise and becomes “fill up” or “change the starter”, or “call a mechanic”. There is another strategy: find an analogy suggesting the characteristics of the objective. For example, if I remember that I left the lights on in my car by mistake and that it drained the battery, I can tell myself that this is what has happened now. Then, I will only have to see if the lights come on to determine whether the battery is on. If they don’t come on, then my vague problem becomes precise and I have a complete process starting off in my head allowing me to solve the situation. Analogies may also be used to find solutions. I can remember an example where one time someone who had a flat battery made his car roll down a hill, which made the engine start without the battery. There is no hill around, but perhaps if I asked my passengers to push the car, this might produce the same effect? Moreover, by taking into account the differences between the analogies and the current situation, we may adjust the analogy to make a prediction. The answer is yes. When we make a request – asking for something or ordering – we need the other person to read our mind. To make this possible, both parties need to lean towards the other. The person making the request can help by specifying the intention behind the request. The person trying to fulfill the request must try to imagine what the other person really wants in order to manage the details that have not been explained. Thus, “can you get some glue when you’re going shopping?” may not seem a difficult request. But when you are in the glue aisle, you can see that there are many different types of glue: for wood, glass, metal, etc. Some Superglues are sold with messages saying that they work every time. Is this true or false? Do I need to dissolve the glue afterwards? Do I need a fast-acting glue? Etc. In general, we are not able to indicate all the details in advance. If you are doing me a favor, I must rely on your ability to read my mind and imagine how I will make all these choices. I do not believe that I am able to anticipate all the important details for you. There are some people I do not trust and to whom I shall not give a difficult task. The Goeben was a German cruiser stationed in the Mediterranean on the eve of the First World War, and the only German warship in the area. The British Navy knew it and was supposed to find it and sink it as soon as the war had been declared. The British failed: they had the Goeben surrounded with a dozen warships, but, became confused about the ambiguous orders they were given by the admiralty, they let the Goeben escape and reach the Black Sea and the Ottoman Empire. It led the Ottomans to get involved in the war on the side of the Axis, whilst many Ottomans were hesitating between neutrality and taking sides with the Allies. It is possible that the entry of the Ottoman Empire in the war may have extended the war by one or two years, with millions more deaths and the involvement in the war of the United States, who wished to remain neutral. The ship closed of the mouth of the Black Sea, cutting off 90% of the Russian naval imports and exports and precipitating, through a situation of want, the Russian Revolution of 1917. How did this happen? When the British forces surrounded the Goeben, the ship’s commander was not sure of how to interpret the instructions from Admiral Winston Churchill, who indicated: “Do not at this stage be brought to action against superior forces.” Although the Goeben was surrounded by twelve British ships, she had 11-in guns at its disposal, whereas the British forces were made up of four cruisers with 9.2-in guns of inferior range, and eight destroyers, including five which were running out of fuel. The commander therefore thought he was in a situation where he was going into action against a superior force and decided to regroup rather than attack the German ship, allowing it to escape to the east towards the Black Sea. The problem was that Churchill had never meant this. His instructions referred to the possibility of the British ships meeting the Austrian flotilla, and by no means the encounter of twelve ships against one enemy, be it more powerful than each individual ship of the British flotilla. When Churchill learnt the news, he was dumbfounded. He had never thought his orders could have been interpreted in this manner. Thus the commander failed to read Churchill’s mind, to guess the intention behind the words. Churchill could have avoided this error, had he added extra information about the Austrian ships. But if had to clarify each point in each order he gave in order to avoid ambiguities, his work would have been impossible. The solution is not to linger on the details. They take too much time and have their own cost. We can pretend that rules and procedures are clear and simple, but they are not. For example, if you give someone the instruction of pressing a button when a green light comes on, and the person asks “what is green?”, there is no way to answer this. We suppose that we live in a common culture with this person, where the meaning of green is known, as are other shared references. If we must work to explain each supposition behind each request, teamwork and cooperation would become impossible. All these types of information are not always required, but this list can be used as a checklist to determine if there are still details to be added. It is also important to note that the ability of a person to read minds depends on the familiarity you have with this person and the clarity with which his/her intent was defined. Hyper-rationality is a mental disorder in which the victim tries to manage all the problems and decisions on a purely rational basis, relying on forms of reasoning that are purely logical and analytical. It is similar to Retinitis Pigmentosa, an eye disease leading to the loss of peripheral vision, which is a lot more incapacitating than Macular Degeneration, where peripheral vision is maintained but the more accurate central vision is impeded. To understand this, hold your fist as far as you can, then lift your thumb up and look at your nail: the nail represents all you could see if you were suffering from Retinitis Pigmentosa. Let’s just say that it would incapacitate you a great deal and you would have the greatest difficulty to move spatially and position yourself. Hyper-rationality is similar, in the sense that the individual who suffers from it tries to base all his/her ideas on one source of power: the ability to apply rational procedures whereas many other sources are useful, especially if they are used in combination with each other. Rational analysis is still a powerful and specialized source of power, which can play a limited role in many tasks, a dominant role in some tasks and sometimes no role at all. Decompose. We must analyze the task – break down the task, the idea or the arguments into small units and basic elements so that they may be manipulated. Decontextualize. Because the created contexts add more ambiguity, we must try to find elements that are independent from the context. In order to do so, we try to find a formal way of representing the world, of treating it like a representation, an image, a pattern. We try to construct theories and maps that can be substituted to the fact of having a direct perception of the task or the equipment. Calculate. We apply a pallet of formal procedures on the elements, as rules of deductive logic and statistical analyses. Describe. All the analyses and representations should be open to the public examination. Carrying out an analysis means decomposing a situation or a problem into its essential constituents. However, there are no “primitive” components that exist naturally. The components are arbitrarily defined and depend on individual objectives and calculation methods. There is no “good” way of decomposing a task. Different people find different patterns. The same person may also find different patterns depending on the objectives to be achieved. If we try to pre-define the basic elements, we must either work with approximate or artificial tasks, or take the risk of distorting the situation to match it to the so-called basic elements. The rules and procedures take a shape that is more or less of the if-then type (as in programming). They often appear to be simple, but the hardest is to properly apprehend if the antecedent condition, the “if”, has been met. This is why researchers prefer to work in a laboratory on problems which are artificially free of context and do not suffer any ambiguity. Outside of the laboratory, it is difficult to make the context limpid enough to ensure everyone agrees that all the requirements have been met. The episode of the Goeben perfectly illustrates such an example where the context makes the appreciation difficult as to whether the “if” has been met or not: Churchill’s order meant “If you meet a superior force, then do not fight”. Did the flotilla commander break this order by judging that the Goeben was a superior force over his twelve ships? The context of the situation makes this appreciation difficult. When calculations require people to estimate probabilities, their own value, or to make other non-natural judgments, we are going ahead of the problems. The problem with deductions is, that there are too many to take into account. If, for instance, we make five deductions from a fact, and five more deductions from each of these deductions, and so on, then the complexity of the fact of developing each chain of deductions becomes overwhelming in just a few steps. The power of processing is not infinite, be it for human or for machines. It is therefore important to understand that rational analysis is a source of power that has its strengths and weaknesses, and that it must be used sparingly and in harmony with other sources of power. A wrong decision is not, according to Gary Klein, defined according to whether the result is good or bad; someone would deem a decision to be wrong if the knowledge they have gained would lead them to make a different decision should a similar situation occur. As we have seen, expertise can provide important sources of power, other than rational analysis. The people with the most expertise are able to see the world differently. Experts spot problems more easily and have richer mental simulations they can use to diagnose problems and evaluate action plans. They have more analogies to rely on. Expertise can bring us a lot of problems. It can lead us to see problems in a stereotypical manner. The sense of what is typical can be so strong that we can miss subtle signs of contradiction. The problem is even more evident when we consider learning from experience. We often cannot see a clear link between cause and effect. Too many variables come into place, and the temporal timescales create their own complications. If managers see that they are successful – by making sure that their projects are completed on time and below the allocated budget – does this success come from their own competence, that of their colleagues, a strike of luck, the intervention of more senior managers, a mix of all these factors, or some other cause? It is hard to say. For example, historians have studied in depth the Great Depression, or the 1929 crisis. Franklin Roosevelt was the US President in 1932, who helped the nation regain its prosperity, and put in place strong actions. Some historians and economists say that these actions had a positive impact, others that they made the situation worse. The 1929 crisis was a major event that has been very closely scrutinized and still, even today, 80 years later, we still do not know if Roosevelt’s actions were successful in redressing the economy. The situation is simply too complex to be analyzed. Because of these difficulties for interpreting the cause and effect relationships, politicians cannot reach high levels of expertise. They can certainly learn the necessary procedures to become politicians – for instance, attending the most influential committees, building links with the lobbyists, doing favors to the right people. But they cannot learn the long-term impacts of the legislation they have put in place. They cannot learn the causal dynamics between their laws and the likely social changes. Their mental model is neither flexible nor rich. In these conditions, we should be careful when supposing that experience becomes expertise. In such fields, experience can give us fluid routines, which show that we’ve been doing it for some time. But our expertise cannot go beyond the surface of routines; we would then not have the chance to develop an expertise in which we can trust. This book is an exploration into the strengths and abilities of the human being. Despite the fantasies of experience, we can give a reasonable meaning to our world. Even when we do not reach high levels of expertise, even when we are confronted with factors of uncertainty and other stress factors, we generally find the means to fulfill and improve our objectives. This book is dense, and somewhat hard to follow. Summarizing it took me over 10 hours, and I skipped some of the chapters that appeared to be less interesting than others. But what interest and power it has! Very far from the traditional rational approaches to decision making, Gary Klein brings us out of the beaten track to explain that people only rarely use this rational approach, and gives us many other ways of making decisions, which he explains by beautifully blending theories with concrete examples. He thus reinstates intuition by defining it and sheds light on the strengths and limits of the human mind in an absolutely captivating manner. Having read and summarized it, I wonder about the transformation of this new knowledge into concrete actions, but what is for sure is, that I have upgraded my mind and I am now perceiving more accurately the way the human mind works and the way we make decisions. My mental pattern is no longer the same as the one I had when I opened this book for the first time, and I feel absolutely overwhelmed that this pattern is now a lot more acute and pertinent. What is also strong is that the author highlights the limits of our knowledge and our current approaches, and particularly highlights the biases that can corrupt scientific studies, as well as the infinite complexity of the human brain and the importance of what we yet have to learn about it. I therefore find it hard today to perceive how this new mental pattern will translate concretely. But it is certain that it can only make me more cautious regarding expertise, more aware of the relativity, and the limits of knowledge. What is the basis for the efficiency of teamwork and the decisions that are made daily. I therefore recommend it. This book is a true jewel of intellectual stimulation, which should make your brain simmer long after reading it 😉 . Have you read “Sources of Power” ? How do you rate it? Read more reviews on Amazon about “Sources of Power”.